"Maybe Heath is in the image...not sure. in case you are still looking for a portrait." ONLINE RESOURCES If you search for "Edward B. Heath", using the Google search engine, (8-24-05), you will find about ten of 33 links. Perhaps the most helpful is the following. THE HEATH PARASOLS This page on the Aviation-Heritage website offers a wealth of information on the life and career of Heath and is fully illustrated with some very nice photographs. You can access the site by clicking on the title above. 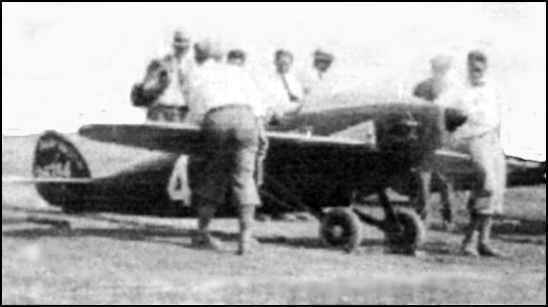 REQUEST FOR HELP I have the 1927 Heath Spokane Super Parasol and am looking for pictures of the airplane that Ed Heath flew in the 1927 Spokane, Washington Air Race. It was the 7th National Air Derby. This airplane took 1st place in the light plane race. It was powered with a Bristol Cherub engine. I am looking for original pictures that I can copy for my museum display and am trying to find out what colors the airplane was painted. I am also looking for the whereabouts of the two 1st place trophies that Ed won in the Spokane race. Is there a copy of the check that he won ?